At the intersection of Broadway and Murray Streets, just blocks away from the towering Wall Street apartments, sits one of New York’s most important buildings. We’re talking, of course, about City Hall, the seat of New York City’s government and the office for New York’s illustrious mayor. It’s no doubt a sight to behold, and there’s little questioning how significant City Hall is for the city, but how much do you know about its history, construction, and the like? You might already know that it’s listed on the National Register of Historic Places and that it’s a National Historic Landmark, but those are easy facts to guess. When was it constructed? By whom? For how much? What lesser-known informant is sitting out there about City Hall, just waiting for an intrepid reader like yourself to discover? That’s exactly what we’ll be getting into today, as we list a few fun facts that you might not have known about New York City Hall. Following a competition in 1802 to find a design for a new government building that would serve as City Hall, a plan submitted by architectural duo Joseph-François Mangin and John McComb Jr. took the top prize. Both were rather accomplished in their fields before they took a shot at the City Hall project. The French-born Mangin once studied law, and had been a resident in Haiti before the revolt. After fleeing to America, he became a surveyor, was a disciple of Alexander Hamilton, and, thanks to said connections, was eventually hired to design the fortifications for New York Harbor, the City’s first theatre, and the first New York State Prison before teaming up with McComb to design City Hall. McComb was the son of an architect — John McComb Sr. — who had designed many churches around the island of Manhattan and even worked on the old City Hall. Well respected in his own right, McComb Jr. designed Castle Clinton (part of Battery Park), which is another New York City Landmark and part of the Register of Historic Places. 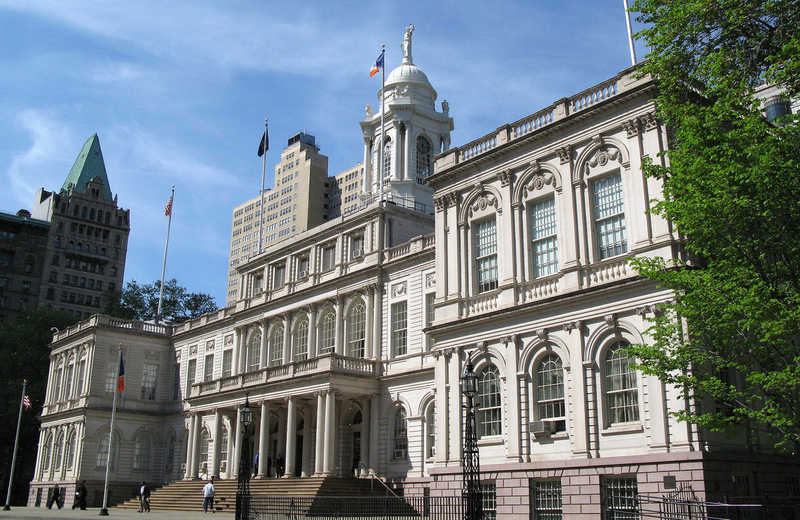 New York City Hall’s current location has been in use since it was constructed back in 1812. That’s 206 years, and the building has bore witness to a number of events throughout New York City history during that time. It has also continuously carried out its governmental function, like holding official receptions and press conferences. Over the years, a number of architects have added to City Hall’s style with their own improvements, including: Leopold Eidlitz (1860), John Duncan (1898), William Martin Aiken (1903), Grosvenor Atterbury (1907, 1912, 1915, 1917), Shreve, Lamb & Harmon (1956), Cabrera Barricklo (1998). City Hall also underwent notable renovations in 2008. Those restorations to both the interior and exterior took around five years to complete and cost a total of $150 million. Not just a run-of-the-mill tour, either. These free tours of City Hall are hosted by the Public Design Commission, the New York City government agency responsible for reviewing permanent works of architecture, art, etc. on city property. They have a deep understanding of City Hall, how it was designed, what’s important, and will point all of that out on their hour-long tour sessions. You have to be at least nine years old to attend, and tours are limited to 20 people, but it’s an enlightening experience — one you’ll walk away from feeling more connected to this awesome city landmark. Well, City Hall Park is, anyway. City Hall Loop, the original southern terminal station for the New York City Subway’s first line which opened in 1904. Once a showpiece of the subway system, it was fabulously designed and quite the spectacle; thanks to inefficiency at accommodating passengers, however, it was discontinued in 1945. Nowadays, it’s only used as turning loop for the 6 train, though, as far as “ghost” subway stations go, this is one of the most architecturally stunning. New York City Hall has served as a backdrop for many a movie and TV show. Most notably, perhaps, are 1984’s Ghostbusters and the mid-nineties TV show Spin City, starring Michael J. Fox. The list goes on, of course, and you’ll also see City Hall’s exterior featured in just about any video game that takes place in the Big Apple. It’s quite the tale, and you can read more about the bizarre story from this New York Times archive article, which details both the shooting and the aftermath. A more pleasant visit to City Hall was that of Albert Einstein. The physicist was welcomed to New York City by then-president of Columbia University, Nicholas Murray, and former New York Mayor Jimmy Walker. You can check out some old footage of the event (and a few others from the famous physicists past) over on YouTube. The proximity to important city landmarks you’ll enjoy at places like 15 Cliff is hard to rival. In addition to the amazing City Hall, there are plenty of other sights you’ll likely be interested in seeing — The 9/11 Tribute Museum, The Museum of Jewish Heritage, Battery Park — it’s a cornucopia of amazing places, and you’ll be right in the middle of it. Be sure to check out more of what 15 Cliff has to offer, and make it your first choice for living in Lower Manhattan.